irfan erdogan was Professor and Chair of the Public relations and Advertising Department at Atilim University, Ankara, Turkey. His yearly contract ended on July 1, 2017. 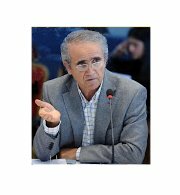 Before coming to the Atilim in 2012, he was a professor and Chair of the Department of Public Relations at the Gazi University (206-2012) and professor of Faculty of Communications and head of the Research Methods Field at Ankara University (1997-2006). He has taught at other universities including Middle East Technical University, Baskent University, Erciyes University, Hunter College and Queens College of the CUNY, USA. He received his bachelor's degree from Ankara University, Turkey (1969) in Radio-Television and Cinema, and his master's degree (1973) in Radio Television and Film from Purdue University, USA, and doctoral degree (1978) in Communication from the University of Pittsburgh, USA. His teaching and research interests have spanned a wide range of topics in communication, from media theory and research, media representation, international communication and (pop)culture to critical study of (eco)tourism and environmental protection. He has published over 20 books, 12 chapters in books and over 80 articles. His most recent books (2018) include (1) "Media of Dictatorship: Supporting the Produced Material Poverty via the Forged Mental and Communicative Poverty, and (2) Television News: Daily Diet of the Polluted Souls. His most read books are Media Theory and Research (2014), Public Relations in Theory and Practice (4th revised edition, 2014) and Media Sociology (3rd edition, printed total 40 thousands, 2015). His new book in preparation is based on a research about the control of science and scientific production by the coordinated practices of industries, state organs and universities. He has also served on various editorial/advisory boards of international and national academic journals and selection committees. He is a past Editor-in-Chief and page designer of the Journal of Communication Research and Theory, published by Gazi University, Ankara. He has organized and took part in the several local, national and international conferences that include a forum and panel discussion on “Soccer and fans: Hostility and competition” (May 12, 2017, organizer), an international symposium on “Culture and Communication in Anatolia: Past, Present and Future” (June 15 – 17, 2016, organizer), an international symposium on “Media and Ethics”, (3-5 November 2006, active organizer for the UNESCO Turkish National Commission, The Scientific and Technological Research Council of Turkey and Gazi University) and an UNESCO International Symposium, İstanbul, 2003, Organizer). He was the member of the Unesco Turkish National Commission and director of the communication section. He directed and participated in various research projects. In 2006, he received a grant from The Scientific and Technological Research Council of Turkey to conduct research on the science journalism in Turkey. He directed a research on Television programs, funded by Gazi University Scientific Research Project (2005-2007). He was the research director of the project on “Evaluation of practices of Turkish tourism agencies in terms of sustainable tourism”, funded by The Scientific and Technological Research Council of Turkey (2008-2010). Currently, he is working on two studies related with the control of knowledge and production of functional ignorance that supplants knowledge.